My dad has always enjoyed building things and has always been very creative with his skills. Growing up, my brother and I were continually supplied with an array of back-yard inventions to play on. Here's dad's latest creation. 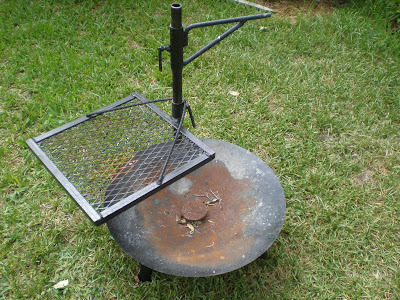 It's a backyard barbeque / cooker made from a disc harrow plow. 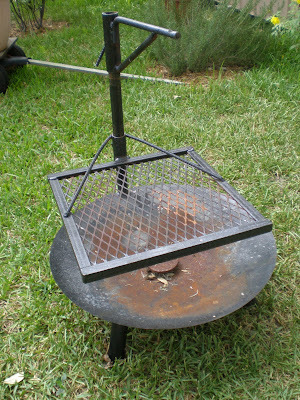 It has an adjustable grate to grill things on and an adjustable metal arm where you can hang a kettle. You don't get much more Texan than this. . . .You just don't. I'm flying down to Texas today for a nine-day visit with family and friends. 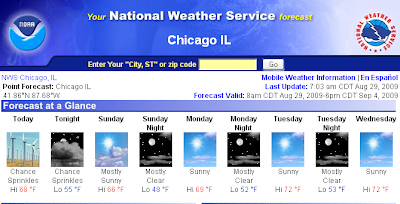 The thing is, we've had a very cool summer here in Chicago. The high today is supposed to be in the 60s. Take a look at our forecast. See the pretty blue skies? The other thing is, they've been having an incredibly hot summer in Texas. All-time records have been broken. They're having one of the worst droughts ever. Check out the forecast for Austin. See the scary blazing skies? I'm not even sure an airplane should be flying in such heat. It looks like it might just burst into flames as it approaches Texas -- sort of like a spacecraft that gets too close to the sun. Trust me, I won't be going outside while I'm down there. I haven't posted a Morning Scene in a while. 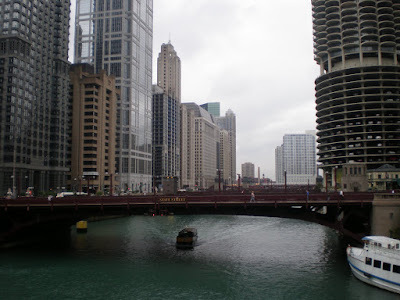 This is the view of the Chicago River from the Wabash Street Bridge which I cross every morning on the way to work. Pick a Name and Stick With It! If I was the King of the United States, one of my first decrees would make it illegal for any bank to change its name . . . ever again. . . .henceforth. For the past thirty years, banks across this country have been on a name-changing rampage and it should stop. One of my first jobs out of college was with American National Bank in Austin Texas. Fine name. It gave you confidence. It had had that name for a century. Then, two weeks after I became an American National Bank employee, it merged with Mercantile Bank of Dallas (along with a lot of other banks). The bank execs began the name-changing by giving them all the generic name of MBank. Oh my goodness, they feigned such corporate enthusiasm over the new name! According to them, MBank going to be the greatest name in all of banking history. MBank was bought out by Bank One two years later. I also used to work for Victoria Bank & Trust Co. Nice name. Our competitor across the street was First Victoria National Bank. (Another nice name) We would often call First Victoria just to hear their switchboard operator answer the phone. She would say the name blindingly fast except for the word “bank” which she would stretch out all sing-songy.
. . . ring . . . . .ring. . . . I have no idea what their name is now. I’m sure she had a hell of a time when the name changed. In the lobby of my workplace is Associated Bank. Here’s the scoop. Their mothership bank in Columbus (or maybe Cincinnati) is on the corner of 5th Street and 3rd Avenue. Fifth and Third. I don’t know. I would just feel weird putting my hard-earned money in a bank whose very name is an improper fraction. So, if I were king, I would not allow any bank to ever change its name ever again. If they had enthusiastically picked a stupid name like Chase or 5/3 or Associated-with-nothing, they would just have to just stick with it. On Saturday morning, the weather was so gorgeous and cool – enough to prompt me to drag my bicycle out of storage, air up the tires and take a leisurely bike ride along the public bike path next to Chicago’s beautiful Lakeshore Drive. Oh my GOD, I’ll never do that again! That public path was festooned with aggressive roller-bladers, runners, walkers, even more aggressive baby strollers, and dogs the size of Volkswagons -- all of which seemed to be going in the opposite direction or wanting to get around me. If my bike could have fit in a taxi, I would have taken one home. I’m surprised I didn’t throw it in the lake. When did bike riding become such an ordeal? I remember as a kid, we’d just take off on our bikes and return hours later, hop off and let 'em tump over in the front yard. Now, I need to make sure I lock it up with a giant U-bolt thingie along with a cable and padlock. After the bike riding fiasco, I went to the farmer’s market (taking the No. 22 bus, thank you very much) and bought twelve ears of the sweetest corn you’ve ever tasted. There were also some white tomatoes. 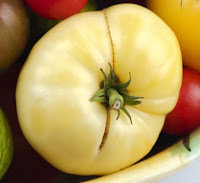 Yes, white tomatoes. When I see something unusual like that, of course I have to buy it and bring it home. They were really good, but then again, any home-grown tomato would be. That, with some of the fresh corn and I was a happy puppy. On Sunday, I got up early to get ready for choir rehearsal at the church where I’ve been singing. (I walked the seven blocks – the Bicycle of Death was left on by balcony.) There’s a Starbucks next to the church where I had a leisurely café Amercano and a scone. A café Americano and a scone at Starbucks will always be part of my worship service. While in the choir loft, I noticed that there was a harpsichord next to the organ. A harpsichord! I even became a little verklempt when I saw the harpsichord. It was then that I knew I had found a church home. People are always making comparisons between the Roman Catholic church and the Episcopal church. Yes, the services are pretty similar. But, obviously, the main difference is that you’ll see a guitar in a Catholic church’s choir loft -- an abomination if there ever was one. In the Episcopal church, it’ll be a harpsichord – like God and Bach intended. I’m firmly convinced that guitars in church make the baby Jesus cry. 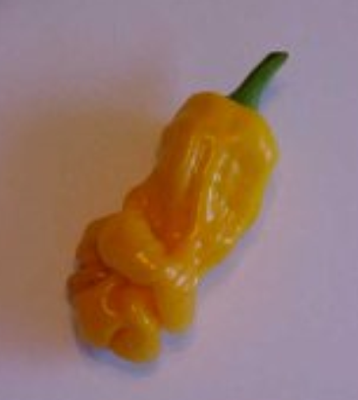 Now that I’m producing Uncle Buck’s Raging Relish, a friend of mine sent me a lead on a new kind of pepper that is very interesting. Peter Peppers are a variety of pepper that are raised in Georgia and are medium-hot on the heat scale. They normally grow to be 4-5 inches long, sometimes longer. Here’s a photo of them. And some on a bush. And they also come in yellow. 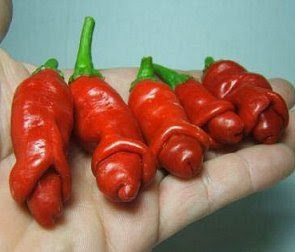 I’m really perplexed as to why they’re called “Peter Peppers”. Maybe the tongue-twister had something to do with it. 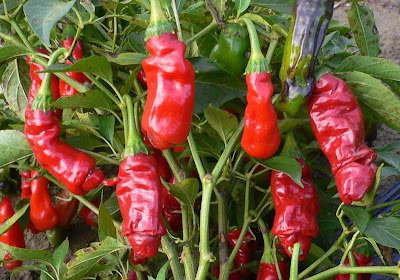 I was wondering how to get my hands on them and after quite a bit of searching, I found an on-line supplier of Peter Pepper seeds. So, if you would like to grow some for your own personal use, you can order them here. They're only $2.65 a packet. 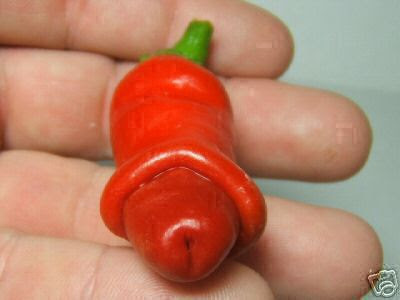 And if you have any ideas as to why in the world they’re called Peter Peppers, I’d surely like to know. Are you a devout Christian and worried what will happen to your pet after The Rapture takes place? You should be. After all, in “the twinkling of an eye,” all believers will be suddenly snatched up to spend a blissful eternity with Jesus. But the Bible doesn’t say anything about your pets. So, to assuage your fears, a group of animal-lovers have formed an organization who you can contract to care for your pet once you’ve been raptured up. Each member of this group is a confirmed atheist, so you can rest assured that they’ll be here to care for your pet that Jesus left behind. Check out Eternal Earthbound Pets if you’d like to fill out a contract for their services. 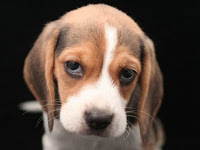 The fee is $110 for one pet and $15 for each additional pet. I really wonder how many people fall for this. . .
And does Jesus really want people who are that crazy up there with him? I actually developed a product and there’s a store in Chicago that has agreed to sell it. I have a contract and everything. 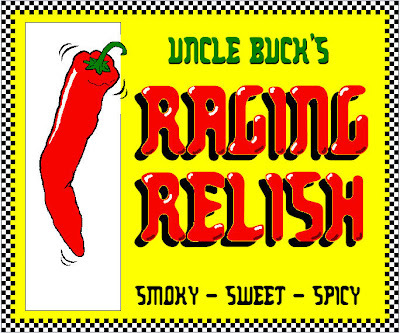 Uncle Buck’s Raging Relish is the culmination of lots of testing, tweaking, and re-testing until I finally got it right. It’s a unique sweet relish made from jalapenos, onions and smoky chipotle peppers. Lots of friends and family members have tried it, provided feedback and it’s been met with really good reviews. It’s really good on nachos, a grilled cheese sandwich on rice and beans, hot dogs . . . The employees at the retail store in downtown Chicago liked it too. And, like I said, I have a contract. But before I go into all that, I have to give a huge note of thanks to dear Speck for designing this label and logo and even naming the product. Creativity like hers leaves me astounded. Isn’t that label incredible? I just love it. Back to the contract. I have to attach lots of other documents to the contract. I have to show proof that the product was prepared in a licensed kitchen. I found one that I can rent by the hour, but I have to have a sanitation license and liability insurance in order to use it. Check. In order for the store to sell it, I have to have a state tax license and federal tax i.d. Then I have to register a company name and have a website. If all goes well, this product will be on the shelves by October. And you’ll be able to order it online too. Takes a deep breath. . . .
During this past weekend, I became a little verklempt on two occasions. Do you remember what verklemt means? Remember Mike Myers’ character, Linda Richman, on Saturday Night Live’s Coffee Talk? Well, I became a little verklempt this weekend – twice. The first time was while viewing that wonderful movie, Julie and Julia. In the first 30 seconds of the film, Julia Child experiences her first meal in a French restaurant. Well, when she tasted that first bite of sole meuniere and displayed such sheer ecstasy, I just lost it. I really did. And that was in the first 30 seconds of the movie. Needless to say, I highly recommend this film. I happily bought a pound of butter and a pint of cream on the way home from the movie. Oh my goodness, it was so nice to be singing in a choir again, especially after having been in that nasty anti-Pepsi church last month. As we processed up, we divided and went into our separate sections, I with the tenors. Then on the third verse, we broke out into four part harmony . . .
. . . Yep. Verklempt again. I’ve got to get a hold of myself if I’m going to be a contributing member of this choir. We’re doing Vivaldi’s Gloria in November and Handel’s Messiah at Christmas. If a simple hymn gets me verklempt, imagine what Vivaldi and Handel would do. I’d just be a big puddle of goo. Anyway, I highly recommend finding moments that get you a little verklepmt every now and then. Linda Richman was definitely on to a good thing. When I lived in Canada, I became fascinated with the Inuit culture -- the native peoples who lived in the northeastern Arctic. I remember when the eastern part of the Northwest Territories became its own territory on April 1, 1998 and became the autonomous territory of Nunavut (meaning our land.) I watched the festivities all day being broadcast from the new capital city of Iqaluit (meaning many fish) and was simply fascinated. What really captivated me was a performance of Inuit women demonstrating the ancient musical genre called “throat singing.” It was developed centuries ago when the men folk would go off for weeks at a time in pursuit of arctic critters and the women would be left alone. They developed this incredibly unique means of singing as a form of entertaining themselves and I have to say that it’s one of the most unusual forms of music I’ve ever heard. Throat singing is performed by two women facing each other and generating sounds in their throats by inhaling and exhaling through the nose and mouth, often making glutteral noises along with some rising and falling tones. What really makes it difficult, is that one woman makes a throaty sound and the other immediately makes a corresponding, imitating intonation, often with percussive noises that don't even sound human. They concentrate on each other in order to keep the process going back and forth -- and like I said, it really is one of the most unusual, yet captivating forms of music I’ve ever heard. I used to watch Inuit television when I lived in Toronto. When I left, I thought I might never hear throat singing again, but thanks to the you tubes, here is a great example of it. Be sure to listen to all the variations. It’s really amazing. Last night, I attended a fundraising function for Chicago’s bid to host the 2016 Olympic Games. Five hundred bucks a plate - - it did not come out of my pocket. It consisted of a glitzy awards banquet in which past Olympians were inducted into the Olympic Hall of Fame. Michael Johnson, Picabo Street, and lots of other noteworthy athletes were there, most of whom I knew very little about. Peter Vidmar and Bart Conner, the gymnasts, were there. Remember them? I was there along with 3,500 other guests. It lasted five hours, well past my bedtime on a school night. Yes, there were 3,500 people there for a banquet dinner. At 500 bucks a pop, I was really curious as to what we were going to be served. We arrived to find our tables already set with individual teeny-weeny shrimp cocktails served in glass thimbles along with anti-pasta type things on skewers. I was really looking forward to see how they were going to pull off serving 3,500 meals in one go. Out came the servers with trays of dinners. The plates were unveiled in front of us and there it was - - - the ubiquitous grilled chicken breast, (Dad? Are you surprised?) along with a fillet of poached halibut, marinated vegetables and rice pilaf. I took one bite and was astounded. I’m not talking about “not hot”. I mean, it was served chilled -- as in 38 degrees – And I’m not talking Celsius – I’m talking Fahrenheit. The other nine people at my table were equally astounded. A server was summoned. She said something in Polish and quickly scuttled away. Then we noticed on the program that it really was a “chilled entrée”. Seriously. It’s bad enough to serve a grilled chicken breast, but to serve it chilled?? If they wanted to serve a chilled dinner, why not serve things that were meant to be served chilled? Vichyssoise, gazpacho, veal in aspic readily leap to mind. A terrine medley would have been nice. Hell, a chicken salad would have been more appealing. But a grilled & chilled chicken breast? Cold rice pilaf? Oh my goodness, it was sooooo bad! Oh, and you’ll be able to view the whole event on TV. Just tune into NBC on Saturday, September 5 at 2:00 pm Eastern and Pacific (1:00 pm Central) and you’ll notice 3,500 people with 3,500 uneaten dinners in front of them. I suddenly have a craving for gazpacho. This photo was taken at a town hall meeting near Washington D.C. yesterday. Don't you just love that sign? 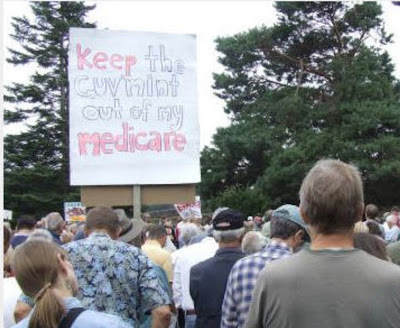 Scenes like these will only ensure a democratic landslide in the next election. I’m sure you’ve all seen the commercials for Brink’s Home Security. Oh my goodness, those commercials bug me! They’re so incredibly unrealistic. In each commercial, there’s a helpless damsel in a house with a kid or two, always at night. Then an Extremely Scary Bad Guy violently shatters a window, trying to do whatever it is Extremely Scary Bad Guys are wont to do. Instantly, the phone rings. It’s a representative from Brink’s Home Security System. Of course, the Extremely Scary Brink’s Alarm has scared off the Extremely Scary Bad Guy who goes fleeing into the night. But Brock and his square jaw has saved the day and stays on the phone to comfort the Extremely Scared damsel in distress. But here’s how it really goes down. At approximately 3:00 am, a raccoon trips the Brink’s security system while rummaging through a discarded pizza box in the garbage. - - which they never heard in the first place. I’m at a loss for something witty and reflective to write about. I haven’t been to see the Julia Child movie yet and that amazes me. (I’ve been out of town with work-related duties). So, I’ll talk about food anyway. It’s always a good fall-back subject. Vincent is this eccentric fellow in downtown Chicago who has this little routine of standing on the State Street bridge and waving at the tourist boats as they pass underneath. He takes off his jacket, waves it overhead and does this little twirl as they pass by. He only does this on the State Street bridge and only to boats traveling east. I had gotten him on video once before but I had the camera pointed the wrong way. I got a good video of him yesterday, though. This church that I sang with for one Sunday is boycotting all Pepsi products because PepsiCo includes sensitivity training toward GLBTs in their new-employee orientation - - along with sensitivity training toward disability, race, gender and religion. PepsiCo has also made a donation to the Human Rights Campaign (HRC) and Parents & Friends of Lesbians and Gays. Yes, I realize that a tax-exempt organization can be as bigoted as they want. That’s the beauty of the separation of church and state. But how productive is it to boycott a company simply because they’re being inclusive of a particular group of people? What is this church hoping to gain by doing so? What message are they sending? But they also say that gay people should not be discriminated against and that they’re even welcome in religious orders. When I saw the reason for this church’s boycott, it was as if they were saying, “We will not support this company because they accommodate people like you and that's wrong simply because of who you are.” That was the message they were sending, loud and clear. That, in my opinion, is pretty messed up. When people do things like this, it’s often an easy and convenient means of placing themselves on a pedestal. It’s often done out of ignorance and fear. What really upset me so much about this, is that I’ve spent the last ten years staying away from the church. I had been so disillusioned from the years that I spent as a monk and a friar while studying for the priesthood. Finally, I was making some tentative steps back and even looked forward to using my music in the Church once again. I think I even prayed for that just a little bit. Then, there was that notice and the message it conveyed. A notice from a church whose mission is supposed to be one of healing and reconciliation, yet it was so disaffected and destructive. I’m not going to name this parish. No matter how much I’d like to have people google the Pepsi boycott and come across my frustrated opining about this parish, my years of wisdom has taught me to never, ever burn bridges and I’m going to stick to that. I’m not going to become an avid Pepsi drinker. I simply prefer the nutmeggy flavor of Coke over the minty undertaste of Pepsi. I'm not going to participate in the next Pride Parade, either, because it's held in June and it's not air-conditioned. Update: I just received an email from the anti-Pepsi church inviting me to sing in the choir on a permanent basis. Hmmm. I think I'll stick with the Episcopal church from now on. Even though Anne Bolyn and Catherine Howard didn't fare too well with the church their hubby initiated, I think it will serve me well to make this change. About a month ago, I was invited to sing in a church choir for a special occasion. The choir director at this church knew of me through someone else and he was putting together a special choir for this special Sunday service. It made me feel very special so I agreed to do it. The music was gorgeous -- a sixteenth century double-choir piece by Victoria and there were just 14 of us making up the double-choir. Mind you, this church was a bit unusual. It was a Catholic parish that specialized in bringing back the old Latin Mass. (Tridentine Rite) All the priests and brothers there wore the old cassocks at all times, the women in the congregation had the lace shawls covering their heads and I got the feeling that for their parishioners, Vatican II was just a vicious rumor. No problem. I’d seen all that before. I was there to make pretty music anyway. I really really enjoyed the rehearsal and singing in this choir. Like I said, it was only for that special occasion but it made me want to be a part of the church again. I considered joining their choir on a regular basis. No Pepsi? What was that all about? I assumed that maybe PepsiCo provided employee benefits that could be applied toward contraception or something like that. Conservative Catholics hate contraception. Well, I googled it and it turns out that a number of right-wing Catholic organizations have indeed called for a boycott of all Pepsi products - - - are you ready for this?
. . . because PepsiCo includes the GLBT category in their new employee diversity sensitivity training (along with disability sensitivity training and a host of others). These Catholic websites claimed that by doing so, Pepsi “promotes homosexuality in the workplace” and we should boycott all their products. Now, how in the world does Pepsi promote homosexuality? Does it happen like this? Two guys are watching football. Yeah, I remember when we boycotted Florida orange juice because of the whole Anita Bryant thing, but this was a church that was calling for a boycott – simply because Pepsi was being inclusive. But no, I’ll leave them alone. If they think that boycotting Pepsi brings them closer to the Risen Christ, fine. Frankly, it sounds pretty disaffected to me though. I still want to sing in a church choir though. . . .
Yada-yada-yada, I’ll be singing in the choir at a nice Episcopalian church beginning next Sunday. After all, Episcopalians don’t make the baby Jesus cry.